As part of my preparation for Steam Tour I picked up a great little reference volume by historian/geek Krista A. Ball. 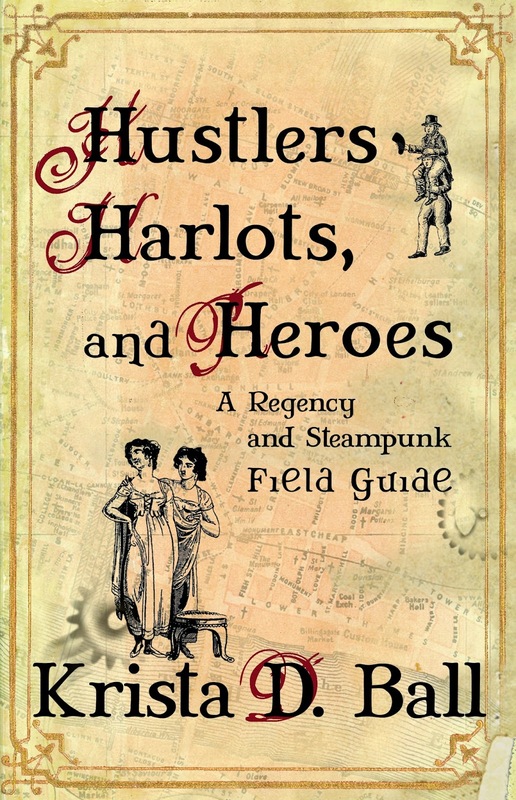 Hustlers, Harlots and Heroes: A Steampunk and Regency Fieldguide tells the story of the untold, the people who populate your Steampunk imaginings but are rarely the focal point. She brings you the inside scoop on the maids, footmen and even your friendly neighborhood knocker-upper (think alarm clock with a stick) to offer readers and writers a window into how the 99% really lived during the Regency and Victorian eras. Ball’s first reference book, What Kings Ate and Wizards Drank, also sounds like a lot of fun, but so far I have only read Hustlers. Both books include recipes that you will want to make at home (and some like tooth paste made from cuttlefish that you’d never EVER want to try) in addition to some great background information and delicious tidbits to add depth and interest to your own Steampunk projects. Let me know if you have any ideas for other reference books I should read before Steam Tour starts in August! I finally got a reliable internet connect here in Greece so I hope to go back to posting more often and letting you know all the amazing Steampunkery that is to come. This entry was posted on June 16, 2014 by Phoebe Darqueling. It was filed under Books, Graphic Novels and Adaptations, Scholarship, Editorials and Opinions, Steam Tour, Travel and was tagged with Book Reviews, field guide, reference book, Regency era, steam punk, Steampunk, Victorian era.